Every day in New York City, millions of commuters take part in a giant race to determine transportation supremacy. Cars, bikes, subways, buses, ferries, and more all compete against one another, but we never get much explicit feedback as to who “wins.” I’ve previously written about NYC’s public taxi data and Citi Bike share data, and it occurred to me that these datasets can help identify who’s fastest, at least between cars and bikes. In fact, I’ve built an interactive guide that shows when a Citi Bike is faster than a taxi, depending on the route and the time of day. The methodology and findings will be explained more below, and all code used in this post is available open-source on GitHub. Pick a starting neighborhood and a time. The map shows whether you’d expect get to each neighborhood faster with a taxi (yellow) or a Citi Bike (dark blue). 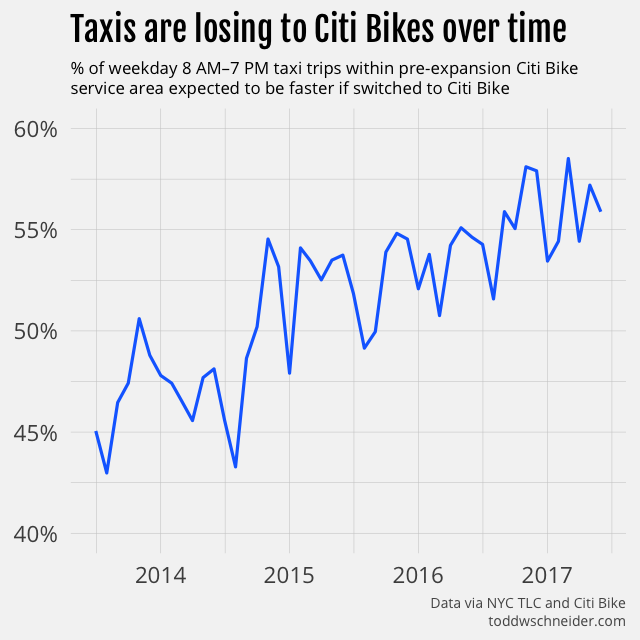 I estimate that 40% of weekday taxi trips within the Citi Bike service area would expect to be faster if switched to a Citi Bike, based on data from July 2016 to June 2017. 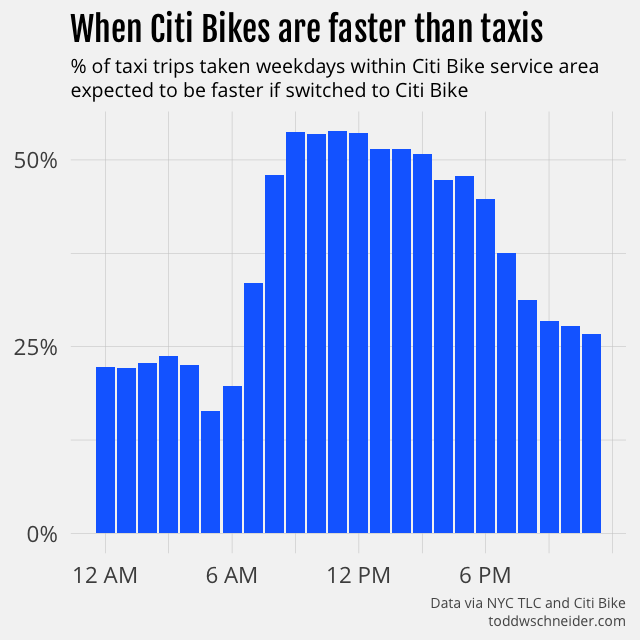 During peak midday hours, more than 50% of taxi trips would expect to be faster as Citi Bike rides. There are some significant caveats to this estimate. In particular, if many taxi riders simultaneously switched to Citi Bikes, the bike share system would probably hit severe capacity constraints, making it difficult to find available bikes and docks. Increased bike usage might eventually lead to fewer vehicles on the road, which could ease vehicle congestion, and potentially increase bike lane congestion. It’s important to acknowledge that when I say “40% of taxi trips would be faster if they switched to Citi Bikes”, we’re roughly considering the decision of a single able-bodied person, under the assumption that everyone else’s behavior will remain unchanged. Heading crosstown in Manhattan? Seriously consider taking a bike instead of a car! Crosstown Manhattan trips are generally regarded as more difficult than their north-south counterparts. There are fewer subways that run crosstown, and if you take a car, the narrower east-west streets often feel more congested than the broad north-south avenues with their synchronized traffic lights. Crosstown buses are so notoriously slow that they’ve been known to lose races against tricycles. 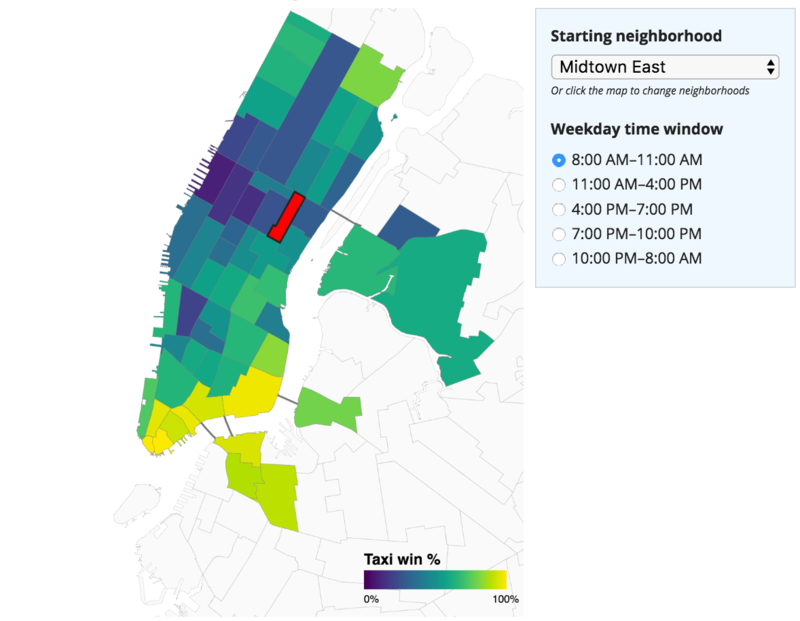 I divided Manhattan into the crosstown zones pictured above, then calculated the taxi vs. Citi Bike win rate for trips that started and ended within each zone. Taxis fare especially badly in the Manhattan central business district. 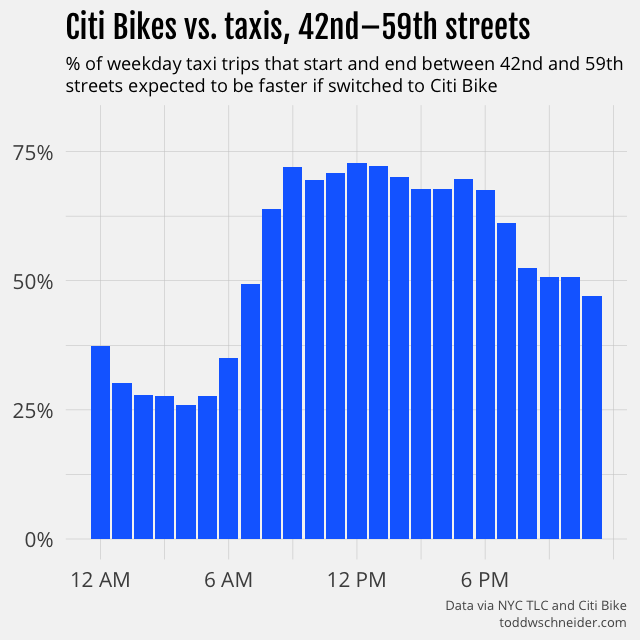 If you take a midday taxi that both starts and ends between 42nd and 59th streets, there’s over a 70% chance that the trip would have been faster as a Citi Bike ride. Keep in mind that’s for all trips between 42nd and 59th streets. For some of the longest crosstown routes, for example, from the United Nations on the far east side to Hell’s Kitchen on the west, Citi Bikes beat taxis 90% of the time during the day. 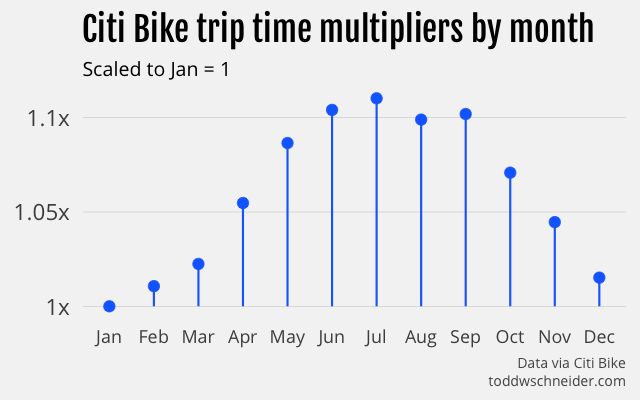 It’s worth noting that taxis made 8 times as many trips as Citi Bikes between 42nd and 59th streets from July 2016 to June 2017—almost certainly there would be less total time spent in transit if some of those taxi riders took bikes instead. A reminder that this analysis restricts to trips that start and end within the same zone, so for example a trip from 23rd St to 57th St would be excluded because it starts and ends in different zones. Note that this month-by-month analysis restricts to the original Citi Bike service area, before the program expanded in August 2015. The initial expansion was largely into Upper Manhattan and the outer boroughs, where taxis generally fare better than bikes, and so to keep things consistent, I restricted the above graph to areas that have had Citi Bikes since 2013. As usual, I make no claim that this is a perfect model, but it does account for the basics, and if we look at the coefficients by year, it shows that, holding the other variables constant, a taxi trip in 2017 took 17% longer than the same trip in 2009. For example, a weekday morning trip from Midtown East to Union Square that took 10 minutes in 2009 would average 11:45 in 2017. 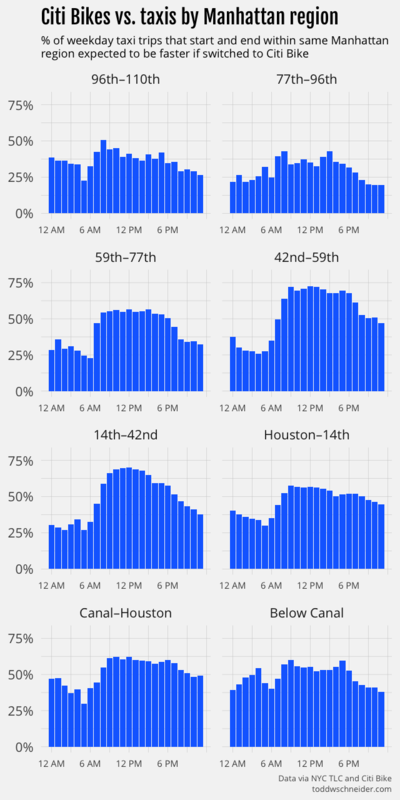 Citi Bike travel times are less sensitive to time of day than taxi travel times. A peak midday taxi trip averages 40% longer than the same trip at off-peak hours, while a peak Citi Bike trip averages 15% longer than during off-peak hours. Rainy days are associated with 2% faster Citi Bike travel times and 1% slower taxi travel times. 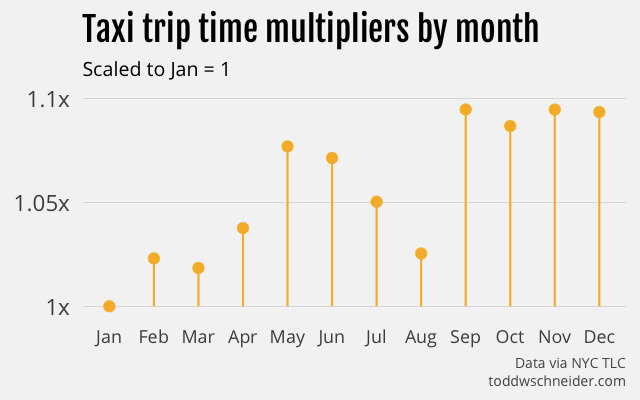 For taxis, fall months have the slowest travel times, but for Citi Bikes, summer has the slowest travel times. For both, January has the fastest travel times. It’s one thing to say that 50% of midday taxi trips would be faster as Citi Bike rides, but how much does that vary from day to day? You could imagine there are some days with severe road closures, where more nimble bikes have an advantage getting around traffic, or other days in the dead of summer, when taxis might take advantage of the less crowded roads. 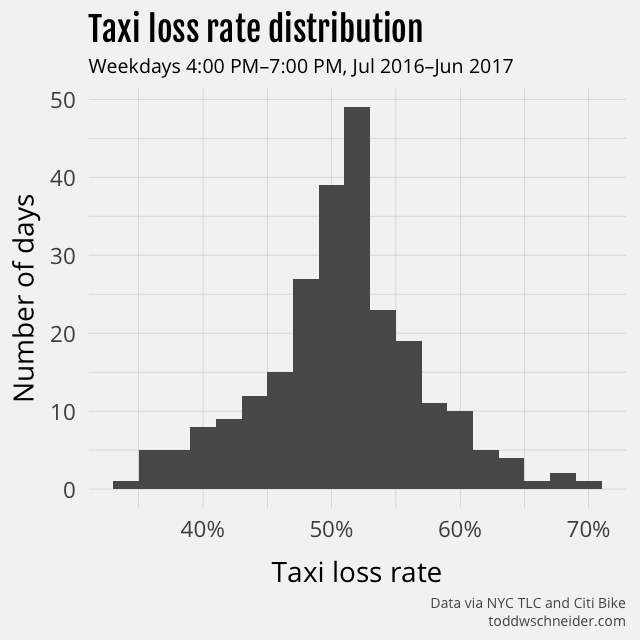 Many days see a taxi loss rate of just over 50%, but there are tails on both ends, indicating that some days tilt in favor of either taxis or Citi Bikes. I was curious if we could learn anything from the outliers on each end, so I looked at individual dates to see if there were any obvious patterns. The dates when taxis were the fastest compared to Citi Bikes look like dates that probably had less traffic than usual. The afternoon with the highest taxi win rate was Monday, October 3, 2016, which was the Jewish holiday of Rosh Hashanah, when many New Yorkers would have been home from work or school. The next 3 best days for taxis were all Mondays in August, when I’d imagine a lot of people were gone from the city on vacation. The top 4 dates where Citi Bikes did best against taxis were all rainy days in the fall of 2016. I don’t know why rainy days make bikes faster relative to taxis, maybe rain causes traffic on the roads that disproportionately affects cars, but it’s also possible that there’s a selection bias. 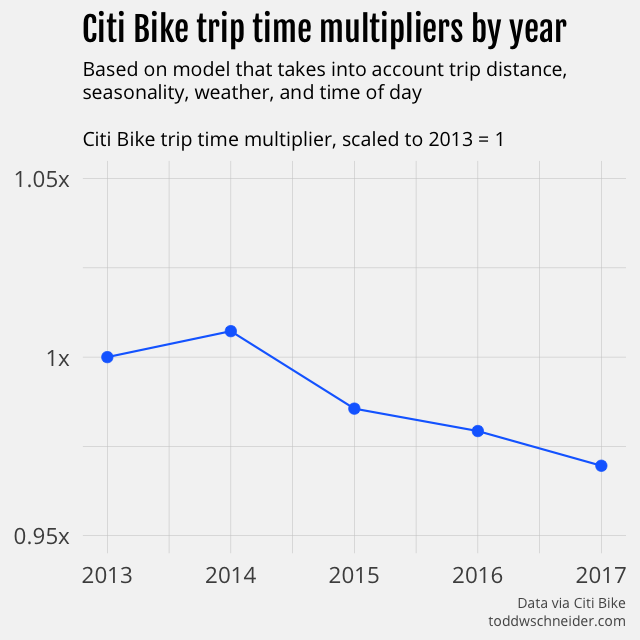 I’ve written previously about how the weather predicts Citi Bike ridership, and not surprisingly there are fewer riders when it rains. Maybe the folks inclined to ride bikes when it’s raining are more confident cyclists, who also pedal faster when the weather is nice. It’s also possible that rainy-day cyclists are particularly motivated to pedal faster so they can get out of the rain. I don’t know if these are really the causes, but they at least sound believable, and would explain the observed phenomenon. A typical afternoon taxi takes 8 minutes, but on June 8, the median was over 21 minutes. The Citi Bike median travel time is almost always 9 minutes, including during President Obama’s visit. The same graph shows a similar phenomenon on September 19, 2016, when the annual United Nations General Assembly shut down large swathes of Manhattan’s east side, including Murray Hill. 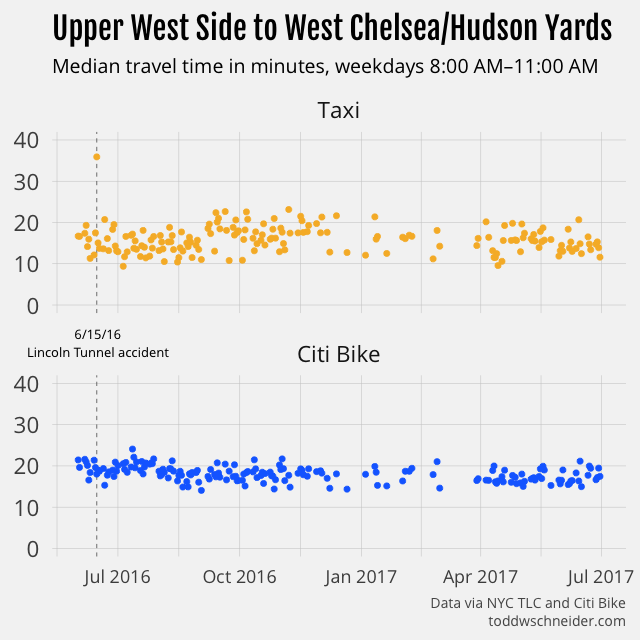 Although the impact was not as severe as during President Obama’s visit, the taxi median time doubled on September 19, while the Citi Bike median time again remained unchanged. The morning of June 15, 2016 offers another example, this time on the west side, when an overturned tractor trailer shut down the Lincoln Tunnel for nearly seven hours. Taxi trips from the Upper West Side to West Chelsea, which normally take 15 minutes, took over 35 minutes. Citi Bikes typically take 18 minutes along the same route, and June 15 was no exception. Taxis would normally expect to beat Citi Bikes 67% of the time on a weekday morning, but on June 15, Citi Bikes won over 92% of the time. These are of course three hand-picked outliers, and it wouldn’t be entirely fair to extrapolate from them to say that Citi Bikes are always more resilient than taxis during extreme circumstances. 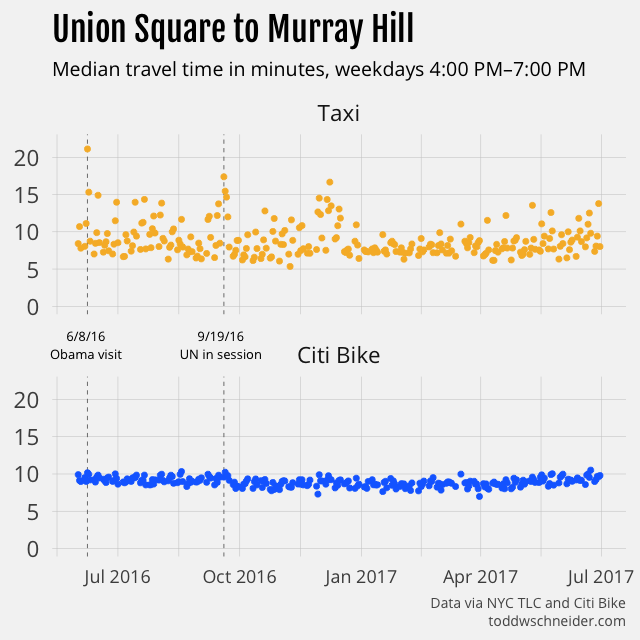 The broader data shows, though, that taxis are more than twice as likely as Citi Bikes to have days when a route’s median time is at least 5 minutes slower than average, and more than 3.5 times as likely to be at least 10 minutes slower, so it really does seem that Citi Bikes are better at minimizing worst-case outcomes. Why have taxis gotten slower since 2009? The biggest slowdowns in taxi travel times happened in 2014 and 2015. 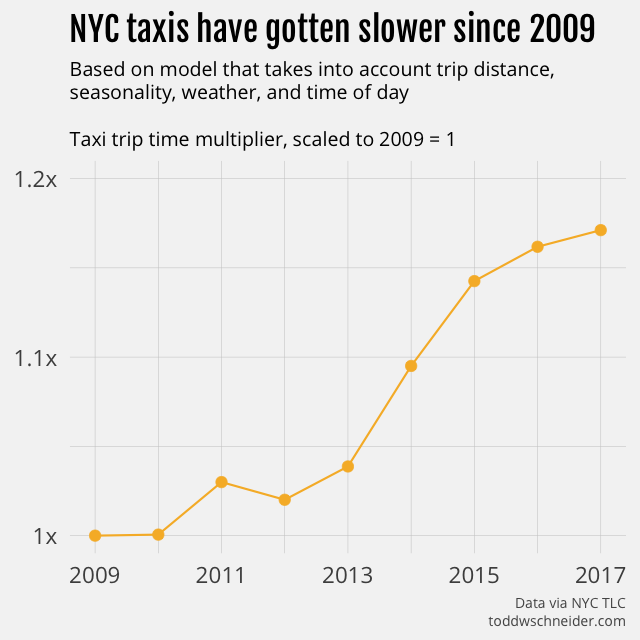 The data and regression model have nothing to say about why taxis slowed down so much over that period, though it might be interesting to dig deeper into the data to see if there are specific regions where taxis have fared better or worse since 2009. Uber usage took off in New York starting in 2014, reaching over 10,000 vehicles dispatched per week by the beginning of 2015. There are certainly people who blame Uber—and other ride-hailing apps like Lyft and Juno—for increasing traffic, but the city’s own 2016 traffic report did not blame Uber for increased congestion. It’s undoubtedly very hard to do an accurate study measuring ride-hailing’s impact on traffic, and I’m especially wary of people on both sides who have strong interests in blaming or exonerating the ride-hailing companies. Nevertheless, if I had to guess the biggest reasons taxis got particularly slower in 2014 and 2015, I would start with the explosive growth of ride-hailing apps, since the timing looks to align, and the publicly available data shows that they account for tens of thousands of vehicles on the roads. On the other hand, if ride-hailing were the biggest cause of increased congestion in 2014 and 2015, it doesn’t exactly make sense that taxi travel times have stabilized a bit in 2016 and 2017, because ride-hailing has continued to grow, and while taxi usage continues to shrink, the respective rates of growth and shrinkage are not very different in 2016–17 than they were in 2014–15. One explanation could be that starting in 2016 there was a reduction in other types of vehicles—traditional black cars, private vehicles, etc.—to offset ride-hailing growth, but I have not seen any data to support (or refute) that idea. There are also those who blame bike lanes for worsening vehicle traffic. Again, different people have strong interests arguing both sides, but it seems like there are more data points arguing that bike lanes do not cause traffic (e.g. here, here, and here) than vice versa. I wasn’t able to find anything about the timing of NYC bike lane construction to see how closely it aligns with the 2014–15 taxi slowdown. Lots of other factors could have contributed to worsening traffic: commuter-adjusted population growth, subway usage, decaying infrastructure, construction, and presidential residences are just a few that feel like they could be relevant. I don’t know the best way to account for all of them, but it does seem like if you want to get somewhere in New York quickly, it’s increasingly less likely that a car is your best option. How representative are taxis and Citi Bikes of all cars and bikes? I think it’s not a terrible assumption that taxis are representative of typical car traffic in New York. If anything, maybe taxis are faster than average cars since taxi drivers are likely more experienced—and often aggressive—than average drivers. On the other hand, taxi drivers seem anecdotally less likely to use a traffic-enabled GPS, which maybe hurts their travel times. Citi Bikes are probably slower than privately-owned bikes. Citi Bikes are designed to be heavy and stable, which maybe makes them safer, but lowers their speeds. Plus, I’d guess that biking enthusiasts, who might be faster riders, are more likely to ride their own higher-performance bikes. Lastly, Citi Bike riders might have to spend extra time at the end of a trip looking for an available dock, whereas privately-owned bikes have more parking options. Weighing up these factors, I would guess that if we somehow got the relevant data to analyze the broader question of all cars vs. all bikes, the results would tip a bit in favor of bikes compared to the results of the narrower taxi vs. Citi Bike analysis. It’s also worth noting that both taxis and Citi Bikes have additional time costs that aren’t accounted for in trip durations: you have to hail a taxi, and there might not be a Citi Bike station in the near vicinity of your origin or destination. One thing to keep in mind is that even though the taxi and Citi Bike datasets are the most conveniently available for analysis, New Yorkers don’t limit their choices to cars and bikes. The subway, despite its poor reputation of late, carries millions of people every day, more than taxis, ride-hailing apps, and Citi Bikes combined, so it’s not like “car vs. bike” is always the most relevant question. There are also legitimate reasons to choose a car over a bike—or vice versa—that don’t depend strictly on expected travel time. Bike usage in New York has increased dramatically over the past decade, probably in large part because people figured out on their own that biking is often the fastest option. Even with this growth, though, the data shows that a lot of people could still save precious time—and minimize their worse-case outcomes—if they switched from cars to bikes. To the extent the city can incentivize that, it strikes me as a good thing. For any readers who might be affected by the L train’s planned 2019 closure, if you only remember one thing from this post: Citi Bikes crush taxis when traveling from Williamsburg to just about anywhere in Manhattan during morning rush hour! The code for the taxi vs. Citi Bike analysis is available here as part of the nyc-taxi-data repo. Note that parts of the analysis also depend on loading the data from the nyc-citibike-data repo. Starting in July 2016, perhaps owing to privacy concerns, the TLC stopped providing latitude and longitude coordinates for every taxi trip. Instead, the TLC now divides the city into 263 taxi zones (map), and provides the pickup and drop off zones for every trip. The analysis then makes the assumption that taxis and Citi Bikes have the same distribution of trips within a single zone, see GitHub for more. 80% of taxi trips start and end within zones that have Citi Bike stations, and the filtered dataset since July 2013 contains a total of 330 million taxi trips and 27 million Citi Bike trips. From July 1, 2016 to June 30, 2017—the most recent 12 month period of available data—the filtered dataset includes 68 million taxi trips and 9 million Citi Bike trips. For example, weekday trips from the West Village to Times Square between 9:00 AM and 10:00 AM would constitute one bucket. The simulation iterates over every bucket that contains at least 5 taxi and 5 Citi Bike trips, and for each bucket, it draws 10,000 random samples, with replacement, for each of taxi and Citi Bike trips. 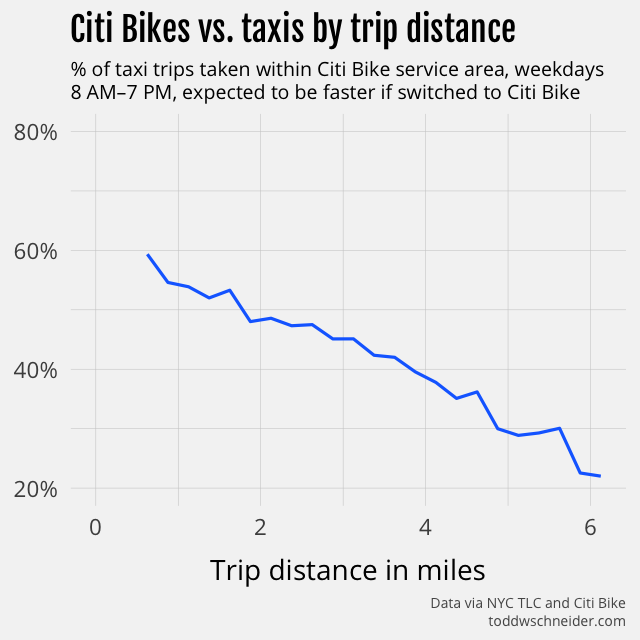 The bucket’s estimated probability that a taxi is faster than a Citi Bike, call it the “taxi win rate”, is the fraction of samples where the taxi duration is shorter than the Citi Bike duration. You can think of this as 10,000 individual head-to-head races, with each race pitting a single taxi trip against a single Citi Bike trip. Different bucketing and filtering schemes allow for different types of analysis. I ran simulations that bucketed by month to see how win rates have evolved over time, simulations that used only days where it rained, and others. There are undoubtedly more schemes to be considered, and the Monte Carlo methodology should be well equipped to handle them.